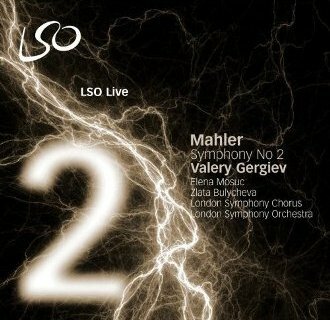 This disc is part of the series of live recordings of Valery Gergiev's Mahler cycle made with the London Symphony Orchestra at the Barbican last season. The reputation of the conductor ensured that these concerts were buzzing with expectation, but in the end critics were divided over whether Mahler really was Gergiev's metier. The performance of the second symphony – paired here with a more than serviceable rendering of Adagio from the tenth – did inspire a unanimously enthusiastic response. However, resurrected as a recording, where the benchmark is much higher, this enthusiasm becomes hard to sustain. The second symphony poses a considerable interpretative challenge to both conductor and orchestra. More generally, Mahler's modernism is characterized by a plurality of perspective and voice that always needs judicious handling in order to be convincing. Then there is the further difficulty in this particular work that the disparate movements, which were assembled ad hoc over many years, are coerced into making a unified statement by the appending of an undeserved, although admittedly magnificent, final choral peroration. Successful readings of the first movement tend to treat the two themes as mutually repellent poles that gain strength through opposition: a taut funeral march theme bristling with the threat of violence alternating with a mournful, floating lyricism, for example. Gergiev, on the other hand, chooses to draw the themes into a loose synthesis. An uncompromising explosive anger in the march material is matched with a stark intensity of what becomes a grieving lament. In its earlier guise as the single-movement Totenfeier this might have been a credible strategy, but it fails to generate the tension necessary to propel us through the remainder of this epic work. Instead, the energy is squandered in the immediate thrill of extreme gestures, and the relentless uniformity of expression results in fatigue. Which might go someway towards explaining the lacklustre reading of the first scherzo. Our hero – whose funeral we have just attended – is fondly reminiscing about the carefree days of his youth. The melody benefits from a lively Viennese lilt, which – apart from a little portamento – is completely lacking here. Indeed, rather than the 'grazioso' called for in the score, the orchestra slumps into a torpor. What are then intended to be outbursts of joyous exuberance, coloured with the merest hint of menace, shift too far towards the threatening end of the emotional spectrum. This spoils the effect of the following (second) scherzo, since it prefigures too explicitly the nightmare world that is supposed to gradually emerge there. This is a shame because conductor and orchestra achieve a blend of light-hearted humour and pungent sarcasm that thoroughly suits the third movement. St Anthony's pointless sermon to the unheeding fishes drivels away in string semiquavers, while other instruments throw their increasingly vexatious taunts from the sidelines. Mahler's message – 50 years before Sartre – that 'hell is other people' couldn't be more genuinely felt. The famous Urlicht that serves as a short prelude to the enormous finale is something of a revelation. It has to be said that mezzo Zlata Bulycheva does mangle a couple of German syllables, but this doesn't detract from the purity of her tone. She holds the longer notes until the last moment before breaking into the usual late-romantic vibrato. Her voice alone thereby invokes the childlike religious devotion of the words. But it is further enhanced by some beautiful sectional and solo playing. In the brass choral, the scrupulously observed articulation helps to achieve a softly ethereal effect. The solo violinist brings a surprising gypsy twist to his intervention (so much more surprising because it works), and the oboe's long-breathed melody is touching in its fragility. Gergiev controls the tempo of the build up in the thirty-plus minute finale with uncompromising skill. Similarly well thought-out and executed tempo schemes can also be found in the earlier movements, but the desired effect is never less satisfactorily realized than here. What is surely conceived as a continual forward-pushing momentum instead results in long stretches where any sense of anticipation is sadly absent. The tedium only begins to lift as we race towards the climaxes. That said, these are well done. When the graves open and we are treated to the sight of the risen marching towards judgement to military band music, the same vicious humour that characterized the reading of the third movement is again in evidence. The final apotheosis is gloriously played and sung. The London Symphony Chorus clearly enunciates every word – even when close to a whisper, the soloists soar above the clamour, and the orchestra seems to bring the whole to a satisfyingly heaven-and-earth-trembling close. As the clanging of the bells fades away, however, one can't help feeling hoodwinked. Part of this is undoubtedly due to Mahler's artificial resolution that attempts to browbeat us into accepting his blissful vision of heaven. But in this recording, the larger part of the blame must lie with the overall quality of performance which simply doesn't do enough to earn the fake ending, and consequently doesn't allow it to seem even momentarily credible.